Join the Only Real-Time, Global Directory! 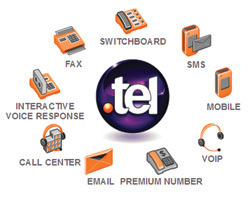 .TEL transforms the way businesses and individuals communicate and stay in touch. Store your data. .TEL acts as a warehouse for all of your contact information. You can store, update, and publish all your contact information, Web links, and keywords directly to the Internet under your own unique domain name. Protect your privacy. Your .TEL site lets you control what information is publicly viewable and what is private. Share your site. Share your .TEL address with a friend or business contact and they'll instantly have access to all your contact information. Be accessible from anywhere! Your .TEL site is accessible from any Internet-enabled device including traditional cell phones, Blackberrys, iPhones, PDAs, computers, and more. No website needed. You don't have to design, host, or manage a Website in order to create your own.TEL site. No matter how you choose to stay in contact with the world (via mail, email, phone, cell, fax, skype, instant messenger, social networking sites, and more), you can post all your contact information to one easily accessible place. No matter how often you move, change jobs, change your phone number, or update your favorite Web links, your friends and family will have immediate access to your latest information. A .TEL domain is a perfect solution for businesses of all sizes. No matter if you're a global company with local offices or a local company looking to grow globally, a .TEL domain puts contact information at your customers' fingertips. In addition to including your company's basic contact information on your .TEL site, you can create a hierarchical data structure, enabling customers to visit your .TEL address and drill down to find the contact information most pertinent to their needs. Customers can access your company information from any Internet-enabled device. If they're on the run and all they have is their cell phone, no problem! They can type YourCompany.tel into their phone browser and instantly your information is displayed. .TEL not only gives you the flexibility to update your contact information on the fly, it also lets you control what information is publicly viewable. For instance, you can choose to make portions of your contact information completely open to the public, while other information, such as your mobile phone number and email address, is marked as private and made accessible only to the individuals you choose. You can even segment which individuals have access to different pieces of your private information. For instance, give your best friend access to your entire contact portfolio, while limiting your boss to your mailing address and phone number.